Livegenic was founded in 2014 by two talented engineers with a background in various industries including insurance, video, finance, and telecoms – and their vision to build secure, scalable products that facilitate easy communication. Visual communication transcends all communication barriers, and is an especially powerful method of interaction for enhancing the quality and experience of customer service. From day one, Livegenic has strived to provide precisely that — to improve the level of customer service by improving the quality of human to human interaction. Constant collaboration with our clients, employees, and investors has helped inform our strategy and growth towards this goal. Our mission lies in simplifying and improving everyday life for our clients, solving problems through interactive communication enabled by innovative technology. Simply put – we are always with our customers – seeing what they see! Our flagship product slogan “See what the customer sees”, reflects our determination to work as closely as possible with our clients, solving their problems on the spot, as it were. From the early days where we had a single mobile App and our first clients we’ve grown into a global company of more than 70 people, offering an ever-growing suite of products and services that are utilized by some of the largest insurance organizations in the world. in technology, attractive front-end design, and reliable back-end architecture. in terms of our relationships with current and prospective clients, partners, investors and each other. in service and product excellence, communicating through clearly articulated rationales in a collegial atmosphere, and making careful decisions based on factual evidence. Livegenic connects every part of the claims process through our mobile and browser-based ecosystem, enabling insurance organizations to optimize existing workflows, reduce costs, shorten cycle time, and improve customer satisfaction. The Livegenic mobile suite incorporates a variety of downloadable Apps and download-free solutions; each designed specifically to support our clients’ specific workflows – from policyholder self-service to professional on-site inspection. All content recorded or uploaded through our mobile suite is stored on the cloud-based Livegenic Web Portal. Through the Web Portal, insurance professionals have complete access to all recorded content, as well as a host of other claims management, collaboration, and reporting tools. 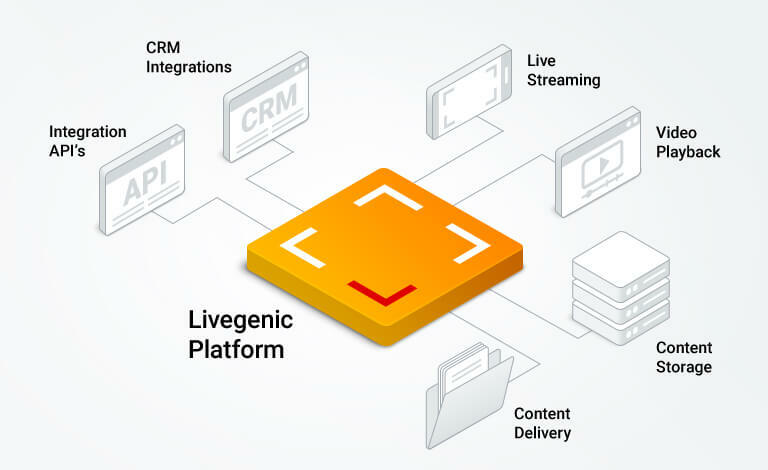 By integrating the Livegenic Platform with our client’s own services, we enable them to access and utilize our cutting-edge insurance technology and claims management tools directly through their own platforms. Our full-time Integration Team works directly with clients to share best practices, integration and workflow implementation support, and constant training and service review. In addition to integration and implementation, our team works side by side with our clients to help them realize a wide variety of custom features and platform modifications, covering everything from AI to physical hardware development. At Livegenic Services, we give our clients the power to turn their visions into reality by creating engaging, high-quality, and user-friendly products. Our team focuses on building products that are user-focused and beautifully-designed with effective, efficient construction and management tools. From front-end to back-end; our team maintains constant communication and our exceptional engineering process to help organizations across the globe build world-class solutions. Livegenic serves a global client base of the largest Insurance Carriers, Reinsurance companies, TPAs, IA and Contractor Networks, and Claims organizations who use the Livegenic platform to help thousands of customers all over the world. The Livegenic Platform was built from the ground up to support the Insurance space. Through our collaborative development with clients across a wide variety of Insurance verticals, Livegenic has constructed a cutting-edge platform that is specifically designed to fulfill the needs of an ever-evolving industry. Our clients consist of Tier-1, regional, and mutual carriers, as well as TPAs, IA networks, and other restoration and repair programs across the globe. Thanks to our direct focus on Insurance, Livegenic is able to support each client’s unique workflows, and every new use case helps our team develop more ways to utilize the Livegenic Platform. Functional teams (different languages and specializations for design, backend and frontend developers). DevOps teams and designers working Ad-Hoc (mostly outside of Scrum sprints). Development timelines that start with month-long Sprints before switching to two-week Sprints once the core project is laid out and ready for review, discussion, and assessment. Scrum development works best when working with a Product Owner on the client’s side. The Product Owner helps maximize the value of the Development Team’s work, and assists in guiding the project through any changes and feedback. Our skills are currently serving clients in a wide variety of sectors and verticals, from E-commerce and Finance Services to Healthcare technology – just to name a few. The innovation and convenience of the Livegenic platform has proven so successful in the insurance claims industry, it is now used to serve other industries as well – such as Financial, Medical (Hardware, Software), Social Communication, Media and Entertainment, and other Field Services. Things have certainly changed over the years! From our humble beginnings, the global Livegenic team now consists of more than 70 talented, hardworking and friendly people who thrive on the challenge of growing their company and serving our customers. We’ve grown from our original two-man team to a group of talented engineers (holding primarily Masters and PHDs), who are are experts in Software and Hardware Development and on building complex tech solutions to serve our worldwide community of clients. Our hardware team has been working on the latest trends in embedded hardware design, producing wearables, monitoring systems, and medical devices. We take full responsibility for our client’s success throughout every stage of development, from the original idea to final production and certification. Livegenic’s Executive Team and Board of Directors consist of like-minded professionals and leaders from a wide variety of industries and verticals, all of whom share a passion for innovation and disruptive technology. Together, they have any decades of experience in disciplines that include Finance, Claims, Business Administration, Technology, Engineering, and Strategic Marketing. We have recently celebrated closing our third round of investment, and wish to thank all our strategic investors – from government-based Ben Franklin Technology Partners who were one our earliest investors in round one, to the leading claims platform, our partner and client Claim Central in round three – for their continued support. We are on hand to answer your questions 24/7.